In a ceremony held at the Royal Festival Hall at the Southbank Centre on 5 October, graduates of LSBU’s School of Engineering undergraduate and postgraduate courses received their degrees. 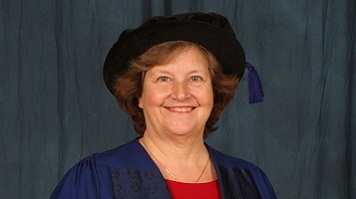 At the ceremony, the title of Honorary Doctor of Engineering was awarded to Professor Dame Ann Dowling for her pioneering work in the field of acoustics and aircraft engine design. She has also broken new ground for women in engineering and focuses considerable energy on encouraging young people – and girls in particular – to follow in her footsteps. Ann Dowling began her career studying mathematics at Girton College, Cambridge, followed by a PhD in aero acoustics. In 1993, she became the University’s first female professor of engineering and was Head of Department from 2009 until 2014. Along the way she has held visiting posts at the Massachusetts Institute of Technology and the California Institute of Technology. Her research has focused on two main areas: reducing noise from cars, helicopters, aircraft and wind turbines; and efficient, low-emission combustion. A key element of her work on noise has been the Silent Aircraft Initiative which has fed directly into the work of NASA and been incorporated into various industry noise and efficiency targets. On being appointed the first female President of the Royal Academy of Engineering in late 2014, she made a public commitment to work with both industry and education to inspire young people to follow what she describes as a creative and rewarding career path.